Wondershot is a top-down, multiplayer focused game with a strong focus on family-friendly party play. Players will take control of different characters in intense “one shot and you’re down” rounds in different map environments. Learn to use the bow, boomerang, hammer, and slingshot and master the special abilities of each weapon. Harkening back to the days of living room battles with gaming buddies, Wondershot is a top-down, multiplayer focused game with a strong focus on family-friendly party play. Players will take control of different characters in intense “one shot and you’re down” rounds in different map environments. Learn to use the bow, boomerang, hammer, and slingshot and master the special abilities of each weapon. 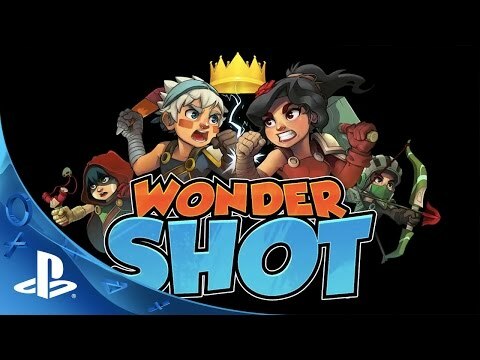 Wondershot also encourages cooperative play as gamers can join together to take on waves of wicked enemies in environments that constantly change. Multiplayer: you can fight 1 to 4 players. Challenges (solo mode): 45 challenges are there to really ask the best from you. Endless (cooperation mode): It's cooperative battles against waves of monsters. The map changes dynamically for each wave! Winner of the ‘Game to Play’ award at Indie Games Play 2015, simple controls, quick pace of play, and surprising intensity make Wondershot an amazing multiplayer experience for all ages.